The telecom market in India is gradually getting saturated. According to TRAI data, the number of telecom subscribers has crossed 600 million mark with overall tele-density of 51%. Incase, of urban users, the teledensity is already close to 100%. India is currently adding 12 –15 million mobile subscribers every month. However, the overall teledensity per 100 people is around 51% – Meaning 51 out of 100 people have either a mobile or telephone connection. The remaining population, mostly situated in rural areas, is still to be connected. Under such a scenario, mobile handset makers are leaving no stones unturned to extract maximum product sales. In order to target a wide base of lower to middle class population, the handset manufacturers are rolling out low-cost products to satisfy the basic need of voice calls. Domestic handset maker Zen Mobile will launch about 15 handsets in the below 2000 range of price to increase it rural presence and overall market share. The company has also earmarked about Rs.30 crore for marketing this year to establish its brand in the country. The formula of low cost handsets coupled with cheaper operator services triggered off from the price wars has paved the way to stimulate the telecom demand in the rural India which still has scope for further penetration. Speaking about more recent examples, the handset makers are also going for inbuilt innovations in order to better cater the product to the final and low-end consumers. For instance, not so long ago, Olive Telecom has come out with a phone that runs on AAA battery, price below Rs.2000 and targeted towards rural consumers. 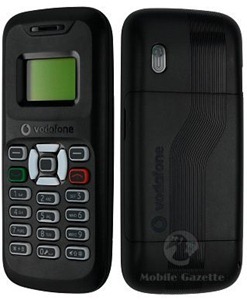 Vodafone recently launched cheapest mobile phone in the world, which will cost less than 500 rupees. Even Nokia has announced that they will soon launch a sub 500 rupee basic mobile phone along with a low cost 3G phone as well. Even home grown telecom companies like Gee Pee Infotech have announced the lowest price colour mobile phones at a paltry Rs.500. This sudden rush of low cost mobile is to cater to rural markets in emerging countries. Last year, Micromax had launched the X1i that offered the users 30 days standby time keeping in mind the problem of frequent power cut problems in rural India. More so, the largely untapped market of low-cost handsets is being recognized by the mobile hardware firms- small and big- to felt their presence and visibility felt at the earliest. Ultimately, not all the brands will survive, but the ones providing maximum features with reasonable quality and price points would make a sustained mark in this wide-based rural target customers. This low-cost game is expected to thrive on volumes deliveries. How deep according to you can the market for low-cost handsets drive itself into rural India?